Campbell’s Stores, a fine and rare example of nineteenth century warehouse design located in the Rocks – the historic heart of Sydney, is undergoing a thrilling transformation. Sydneysiders and visitors alike will soon enjoy a unique and prestigious dining precinct, coupled with sweeping vistas of Sydney Harbour and unprecedented public amenity. Furthermore, this is an integral part of a broader plan for the revitalisation of Campbell’s Cove – a development of state significance – that will create the largest community space in the area, incorporating a new promenade, pedestrian plaza, waterfront recreational area and amphitheatre which will be capable of hosting gala events, festivals and performances. The sandstone and timber buildings of Campbell’s Stores represent a tangible reminder of Sydney Cove’s rich and varied past, as a frenetic hub of trade and shipping. They were constructed in stages dating back to 1839 and throughout most of the remainder of the nineteenth century. There are eleven bays, ten of which are almost identical, while the final bay was added in around 1890. 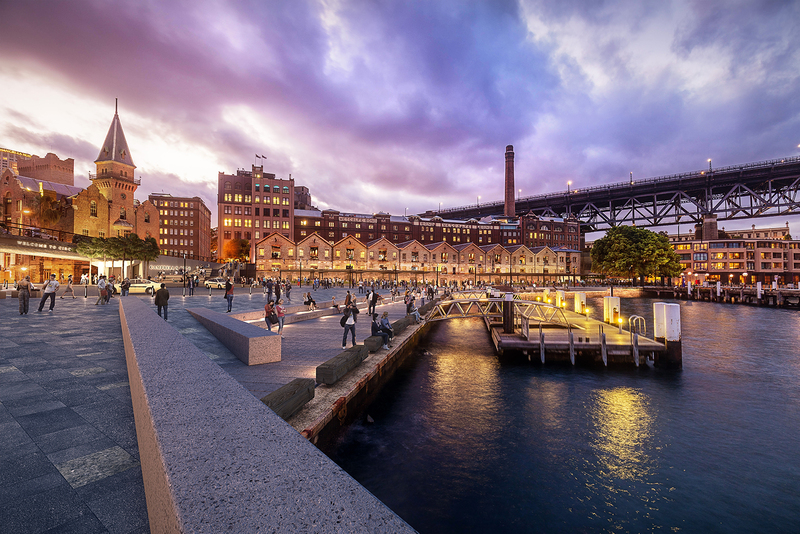 In April 2017, planning approval was secured for the remediation and adaptive reuse of the complex, paving the way for the vision of Tallawoladah and JPW Architects to extend the life of the buildings, ameliorate their appearance and function, and ultimately enable future generations to take in the buzz and vitality of modern Sydney while simultaneously absorbing the ambience of its fascinating story. The design has been praised for its sympathetic integration and delineation of new and heritage elements and careful consideration of the intent of the overall development plan for the Rocks, an area which attracts over 14 million visitors a year. First to be addressed was the improvement of the condition of irreplaceable heritage features such as the sandstone walls and tiled roof. The outdoor dining areas as well as the internal fitouts will be substantially upgraded, and the surrounding public areas will benefit from extensive landscaping and improvements to the pedestrian access network between and within Campbell’s Cove and the Rocks. Up to twelve tenancies will house world-class restaurants, bars and cafes, offering the luxurious experience of alfresco dining on the shores of Sydney’s iconic harbour. Along with its proximity to the diverse attractions of Sydney Cove (and to the Overseas Passenger Terminal), this is sure to be a major drawcard for locals and tourists, boosting the city’s economy as well as its vivacious character. At CORE, we have embraced the fire safety engineering challenges inherent in such a development. Working with buildings of historical significance introduces an imperative to the entire design team and all stakeholders to maintain the sensitivity of the concept to its context. Specific performance solutions have been developed to accommodate the preservation of valuable historical features such as the beautiful timber interior elements, and departures from standard configurations of exits and locations of equipment. Additionally, a wide range of occupant demographics, as well as hazards specific to the hospitality industry and to places of public assembly, can be expected to be present. The only building of its kind on the Sydney Cove foreshore, Campbell’s Stores represents a living slice of vibrant Sydney history. When this stunning refurbishment is completed in 2018, a vast new audience will have the chance to appreciate a very special space, made possible by a powerful vision backed by responsive collaboration.